The Hurricane gives an incredible freefall effect, while spinning at speeds of over 14rpm! This intense thrill ride features eight individual seats that spring upward and downward as the entire ride rotates in a fast fury of excitement. 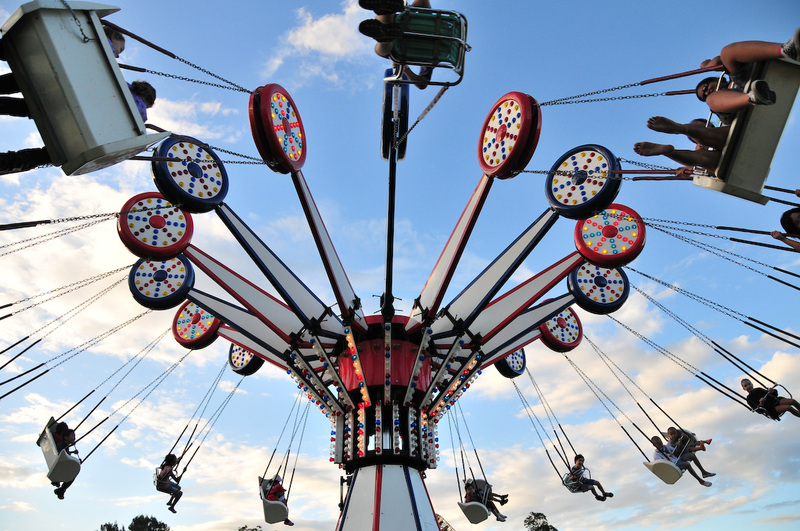 Once reaching full speed, the ride arms reach skyward, then trademark bursts of compressed air, sends riders plummeting downward and upward, sweeping over the heads of the crowds below. ​Height requirements 130cms to ride alone or 120cm accompanied by an adult. Put the pedal to the metal!Everyone gets a jolt out of ageless Dodgem Cars - a theme park classic and one of the most popular rides available today. It's Helter Skelter on wheels, as drivers put their "pedal to the metal" for three minutes of frantic, frenzied fun! Buckle up, start those engines and prepare for a street legal whirl around our track bumping and thumping your friends along the way. Height requirements - 120cm or 90cm if accompanied by an adult. There's nothing like the ride of your life!The Miami Trip sees riders sit side by side and rotate either clockwise or anti-clockwise, in a fabulous circular motion. At the top of each rotation, high negative G-forces are experienced. 'Over the shoulder' safety restraints ensures maximum safety for all riders. Great airbrush artwork, and a pumping music system, gives the perfect backdrop for a fantastic ride! Minimum Height to ride - 125cm. The Round Up uses centrifugal forces to pin 30 screaming riders to the wall, as it spins then lifts to a 45 degree angle. For thrill-seekers who like their rides fast and furious, the Round Up takes passengers on a gravity defying experience they will never forget. Height requirements - ROUNDUP- 120cms. You'll get blown away on the Whirlwind!Get swept up in the Whirlwind - an awesome combination of blazing colours, dazzling lighting and swirling motions. Reaching a top speed of 12 rpm, the ride arms rise then fall creating a "wave" type action. Parents can share in the excitement on what must be THE perfect choice in "family" rides. Height requirements - 100cms or 80cm if accompanied by and adult. It's a Wipeout!Six players take their positions on inflatable podiums, then put their stamina, agility and timing to the test as the giant padded Arms go round and round "sweeping" everything in their path. Featuring two Arms set at different heights, players need to duck, weave and jump to avoid being knocked off their feet, and to be the last one standing. As the operator can regulate the speed of the rotating Arm, Wipeout Challenge is suitable for young children to teenagers. You just can't beat the free-flowing fun of the Super Slide! 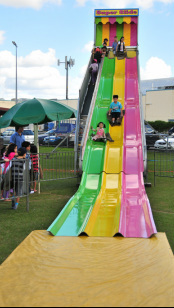 Children never get tired of sliding, and our multi-coloured Super Slide is the biggest of them all. Combining excitement, wide appeal and high throughput; super slides cannot be beaten for performance and safety. Specially designed woollen Sliding Mats are provided, ensuring maximum comfort and safety. Height requirements - 100cms or 80cm if accompanied by an adult. Come and have fun, as you get spun!Ever experienced the excitement and spectacle of the wonderful rides at Disney World ? Then you will know how much fun the whole family will have on our Cup & Saucer. Our Tea Cup Ride "put the world in a spin" when we first imported this UK classic, back in the 1990's. Since then, it has reached legendary status, becoming a "must" at every fete, fair or fun day..
​Giant inflatable obstacle course set in a pre-historic theme with squeeze rollers, ladder climb and the legendary Dinosaur Slide! Age suitability: Children 5 to 15 years with two queues in operation based on size/age. ​Set sail in the open seas!There's nothing like feeling the salt water air on your face, and our Mini Rockin Tug Boat ride does not disappoint! You'll feel the fun of the waves as you rock back and forth, and if you're worried the seas might be a little too choppy for you, it's ok. This attraction caters for all ages, so you'll always be able to bring your First Mate along or Mum and Dad. Age suitability - 100cm or 80cm if accompanied by an an adult. Laser Skirmish is an immensely popular game where players must de-activate their opponents, using Sci-fi styled Laser Phasers. Age suitability: 6 years and over. Parents are welcome to participate with their children. Who can forget the ups and downs - rounds and rounds of the Carousel? Our old-fashioned Merry-Go-Round features hand-carved, beautifully painted horses that spark the imagination of young and old. Chariot themed seats are also available for those toddlers who like their rides in style. Go for a whirl and see why the Carousel, is the memory maker for all ages. Children can Rumble in the Jungle on this huge Jumping Castle featuring brilliant colour, shade-cloth roof cover and inflatable characters. Pre loved , toys, books, utensils, unwanted presents, household items and lots lots more. Come and grab a bargain! Bringing the country to the city. Every child will love the ability to experience a pony ride. Camel Rides - 'The Caravan's of the Desert'. Take a 'Middle Eastern' journey with kids and share the delight of these amazing animals. The kids will be in awe of these amazing animals from the second they lay eyes on them. It's not everyday you see a camel in MacGregor!